I think Colm Tóibín may be on his way to become one of my new favorite authors. There is something about his writing style that I find very comforting and beautiful. I first discovered him while working my way through the 1001 Books to Read Before you Die list. I loved The Master — a fictionalized portrait of Henry James that was shortlisted for the Booker Prize in 2004. I became equally enamored with my latest selection: Heather Blazing. Heather Blazing is set in late twentieth century Ireland. Protagonist, Eamon Redmond is a high court judge whose professional life seems to be bleeding into his personal life. Eamon is emotionally detached, a quality that serves him well as high court judge but that isolates him from his family. Tóibín explores why Eamon is so disconnected from others in his personal life through exploration of his past relationships. Flowing effortlessly from past to present, Tóibín constructs a complex picture of Eamon from his relationships with his father, first girlfriend, wife, and children. I found this to be a wonderful book. It is a quiet and understated novel with emotional themes that are portrayed in a very subtle manner. The landscape plays a prominent role in setting the scene and the descriptions of the coast are stunning. In some ways, this book reminded me of Banville’s The Sea. Tóibín’s prose is different – not as flowery and erudite as Banville’s style but they both focused on the role of the sea and nature in a similar manner in these two books. Fortunately, Tóibín’s writing is much more accessible than Banville’s writing. In Heather Blazing, the descriptions of nature and the erosion of land by sea, parallel the way that Eamon is being eroded as the past fades and his wife and children float away from him. The erosion of the Irish coast is the central metaphor to describe what is happening to Eamon and it’s quite clever. This is not a book for readers looking for a fast paced and dramatic book. If that is what you are looking for in your books then Tóibín is not the author for you. 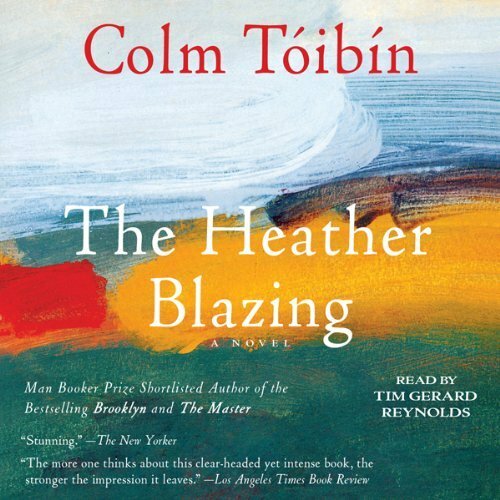 Tóibín is an author for readers who enjoy subtle emotional and poetic writing and quiet contemplation of themes. This particular novel deals with themes of regret, isolation and loneliness, and memory. I think it will probably appeal more to the older reader. I don’t think it will be as appealing to people in their teens or early twenties because the premise of the book is a contemplation of a life with regrets related to parenting, marital relationships, and aging. It’s not that a young reader can’t appreciate those things, however, they will be more relatable to people who have lived through those experiences. In sum, I really enjoyed the book. It was thoughtful, understated but emotional, and beautifully rendered. Many of the themes and events were quite sad but the book does end on a hopeful note that leaves the reader looking toward the future in a positive way. I highly recommend this book to those who enjoy slow, contemplative books. Note about the audio: I listened to this book because I bought the audible version. I really enjoyed the narrator’s rendition of the book. Perfect fit for the story and emotional tone. If you like audiobooks, this is a worthy version. I am trying to get into The Master at the moment, but struggling. I have listened to Tóibín’s Brooklyn and that was quite interesting, but I am not sure I would have had the stamina or patience to read it all the way through. Maybe his style does suit certain people better in audio, I hadn’t thought of that. I thought I would like it because I enjoyed What Maisie Knew, which I read recently. I hope that is enough to keep me going! I need to read Brooklyn and The Master first because I already own them but this sounds wonderful. Your comparison with Banville is interesting. I do like Banville but he’s not the most accessible. I’m glad you find Toíbín more readable.